• High-speed motor and unique gear train provides 33% faster line speed than the ZEON(Up to 70% faster than other winches!) and increased durability. • Plug two 12V accessories directly into the winch and control with remote—no drilling through the firewall. • Full IP68 waterproofing keeps water and the elements out. • Large diameter drum reduces rope wear, dissipates brake heat, and features a unique rope anchor system for strength. • Convertible control pack for upright or low-profile mounting options. 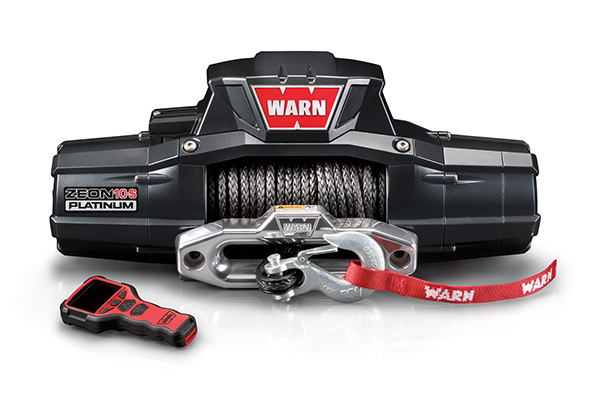 • Available in 10,000 and 12,000 lb capacities with lightweight, easy-to-handle Spydura synthetic rope or durable steel rope. To calculate the best size winch for your vehicle simply find your Gross Vehicle Weight Rating (GVWR) and multiply it by 1.5.